This isn’t the first time we’ll talk about seaweed here at Happy Body Formula, and it probably won’t be the last. We’re all about covering ground when it comes to superfoods, so seaweed is quite the hot topic. We’ve recommended sprinkling dulse flakes atop soups, salads and whatever else you fancy when we chatted about easy meal upgrades. That’s just the tip of the iceberg, though! Seaweed is an incredibly nutritious food, and it comes in many varieties. As new products emerge into our supermarket aisles from under the sea, it might be important to know the ins and outs of this miracle food so that we can make the most of all the health benefits of seaweed in our diet. This stuff is taking over in all things good and green, so step aside kale… we’re diving a bit deeper. First, it might be helpful to cover the different names of seaweed. You likely won’t walk into the store and find the convenient ‘Seaweed’ section popping up anytime soon unless your Whole Foods is ahead of the game (we wish). It goes by many aliases, all of which have their own unique flavor and nutrient profile. If you’re wondering how to eat seaweed, there are plenty of suggestions below. In fact, you’ve likely eaten more of it than you think. This is a red seaweed, often sold as flakes. You might even find it in a shaker bottle for easy sprinkling, much like salt. In fact, it could replace salt entirely if you’re watching your sodium intake. It’s actually been said that it tastes like bacon, both smoky and salty, adding depth to plain Jane meals with its umami power. Whole dulse – leaves, not flaked – should be soaked prior to consumption. This is arguably the easiest way to add more seaweed into your diet. If you’ve ever eaten sushi, you’re likely more familiar with nori than you might think. It’s become more commonplace as a healthy snack food, sold in smaller sheets for easy consumption. You will likely find these easily in the Asian food aisle or market. You can use them as wraps with any desired filling, make your own sushi, have them plain as a snack, or tear larger sheets into shreds to sprinkle atop your entree. Nori is often roasted which cuts away at its fishy flavor and turns it into something quite palatable. Another seaweed that’s making its way into more and more people’s lives (and dinner plates), kelp is an exceedingly popular choice. While it encompasses many brown seaweed varieties, you can find some easy-to-use and tasty products made from kelp. Like dulse, you can find it in flaked form or you can purchase dried kelp and rehydrate it. You can also check out our roundup of kelp noodle recipes which make a lovely pasta replacement. Now we’re getting into the more obscure stuff, but if you’ve ever ordered a seaweed salad as a takeout side, this is often what you get. You won’t have much trouble finding dried wakame at your local Asian grocer. It has a subtle sweetness to it that might make it a bit more appetizing to the seaweed newbie. It’s most often served in soups or salads, but you could put your own twist on it! Simply soak dried wakame in some water and consider adding it to a stir-fry in place of noodles or rice. Most kombu comes from kelp (lots of seaweeds are technically kelp), but it’s often sold as ‘kombu,’ so it’s worth a mention here. It is usually found dried or pickled in vinegar if that’s your thing. It’s the seaweed that gives dashi broth its distinct and complex flavor. In Japan, it has many culinary uses. It’s even brewed into tea. Can you guess what it’s called? Not to be confused with fermented tea, this seaweed brew is also called kombucha! It’s worth mentioning that each variety of seaweed is unique. They all contain their own unique set of nutrients, and every seaweed product is good for something. Here are some of the most convincing health benefits of seaweed. If you read into seaweed at all, iodine is the BIG takeaway across the boards. This nutrient is lacking in most other foods besides salt, so we’re generally not getting enough of the stuff in our diet. 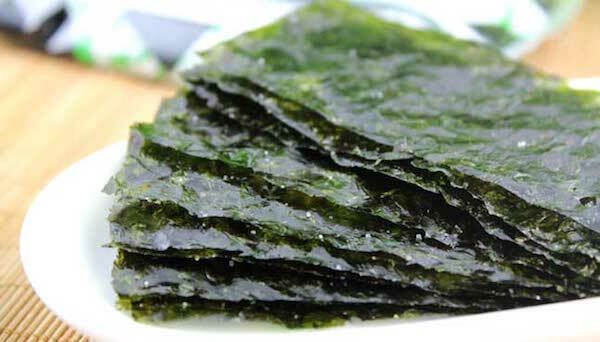 Proper levels of iodine are associated with a health thyroid which is why seaweed may be associated with weight loss. Proper balance of the hormones produced by the thyroid can also lead to increased energy and lower cholesterol. Mild iodine deficiency is relatively common and subtle, but eating just one gram of seaweed per day offers up the daily recommended value. In animal studies, wakame in particular has been found to prevent high blood pressure and lower cholesterol. Moreover, seaweed intake has been linked to reduced risk of stroke and heart disease. In addition to a diet rich in fruits and veggies (approximately 10 cups per day), seaweed has some serious preventative properties to keep your heart happy and healthy. We’re all on board with better digestion, and there’s a lot we can do beyond getting enough fibre which seaweed has plenty of. Alginate, something found in seaweed, can help protect the gut wall while increasing good bacteria in the gut. A healthy gut = a healthy you! It also helps food to release energy slowly which also contributes to its case for weight loss as you feel fuller for longer. Forget about the juice cleanse, folks. While seaweed has been studied under some pretty extreme circumstances in this regard, it still applies to everyday life. First, the big stuff: consumption can decrease ill-effects of radiation which is a pretty convincing argument for tossing some sea veggies in your soup. On a smaller scale (assuming you aren’t exposed to radiation), it protects the body from toxins found in our environment like lead and cadmium. Feeling hungover? Getting over a cold? Maybe you should give into that sushi craving after all. Seaweed – specifically kelp – has been shown to reduce phlegm, lessen swelling in the body, and even soothe an upset stomach after a long night of drinking. Forget over-the-counter remedies and toss a little kelp into a piping hot mug of broth. What is your favorite seaweed variety or way to use it? Share some of your most beloved green products with us below!